You can never have too many dice! Whether you’re looking to start your first dice collection or add to an existing large collection, we’ve got you covered! 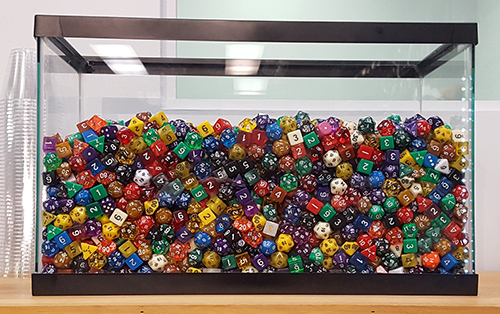 You can buy from our new dice tank a scoop at a time! We have 9-ounce cups available which you can use to scoop up a rounded cup of dice from the tank for $22.95 each. Erika and Nick spent all afternoon yesterday scooping dice and figuring out how many dice are in one scoop. The scoops contained between 43 and 56 dice each, averaging about 51. So your average cost per die is a low 45 cents!